"Die Einspielungen sind passend, geschmackvoll und sehr gut aufgenommen und präsentiert." Ueberschall have built up an impressive series of titles — in both number and content — based around their Elastik Player front-end. The bulk of these follow a construction-kit format offering collections of genre-specific music composition broken down into their constituent loops, and which Elastik allows you to mix and match, tempo- and pitch-shift, and otherwise blend into your own projects with a minimum of fuss. However, they also offer an Instrument Series for Elastik with libraries focused upon specific instruments — such as the Concert Flute and Trumpet 2 titles reviewed previously in SOS — and providing large collections of melodic phrases. 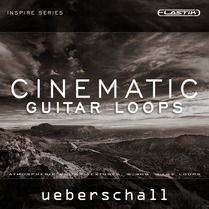 Their latest offering — Cinematic Guitar Loops — is a bit of a hybrid of these two approaches. Yes, it offers a collection (and a very sizeable one at that) of melodic guitar lines designed with media and film composers in mind, but the bulk of these are organised into mini-construction kits, each with several loops that can be linked or blended, as well as various guitar parts and often a suitable bass loop. In total, the library provides over 6GB of samples and contains around 1200 individual loops. The loops are organised into these mini-kits under four categories: Ambient (dreamy soundscapes), Themes (a somewhat stronger emphasis on melody? ), FX (lots of interesting processing applied) and Distorted (no prizes for guessing). Within each kit at least three different guitar parts are included and these are provided in both dry and processed versions. Pre-mixed loops are also provided along with some intro- and outro-style loops for easy cue construction. As befits the ‘cinematic’ reference in the title, most of the loops are extended in nature, with eight- or 16-bar lengths the norm. OK, so for a loop library the asking price is perhaps not in the ‘impulse buy’ bracket for most, but there is plenty of content and Elastik itself allows you to squeeze plenty of mileage out of that content. In the ‘Ambient’ and ‘Themes’ categories, the playing is suitably tasteful and very well recorded and presented. It’s not all Ry Cooder and Paris, Texas but, stylistically, it creates the same atmospheric moods. That does mean that Cinematic Guitar Loops is perhaps quite niche in its target audience but, for composers without the necessary guitar chops, there would be some useful ammunition here if you had a moody, atmospheric, scene just crying out for a bit of dreamy guitar playing.